What's in the envelope?! Titia has brought an award to Hailey Rotary. Member Joan Davies is an artist! Member Joan Davies presented Jim Keating, Executive Director of the Blaine County Recreation District with an original painting of 'The Barn'. The historical building is located adjacent to the BCRD swimming pool and a valued building to those in our community. Joan had promised to paint the barn for Jim some time ago and finished it just in time for him to fill a vacant spot on his office wall. Jim was honored to receive the painting after speaking to Hailey Rotary on March 8th. He and his staff continue to do great things for our valley. A ballet visit from Footlight Dance Centre! Meet Titia Groenhof, Rotary Youth Exchange 2017-2018. Titia is from The Netherlands. Titia loves waffles and the color blue. She doesn't miss the rainy Dutch weather but prefers the sunny Wood River Valley. Titia is 16--almost 17. Wish her a happy birthday on November 7th. She has one older brother. Her favorite holiday is New Year's. Titia has a great sense of humor. Everyone enjoys visiting with her because she keeps everyone in stitches. Our outbound exchange student, Lindsay Browder is living in Ecuador. She's doing great and loves it! Lindsay is living with a Rotary family and having fun. The heart of Rotary is our members, dedicated people who share a passion for community service and friendship. Thank you for your commitment to our community. 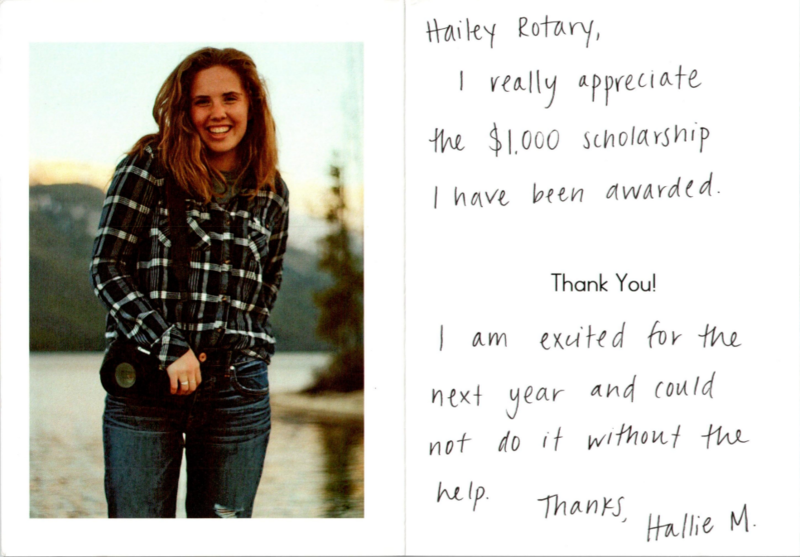 Every year our Hailey Rotary Club gives scholarships to graduating seniors. Here is a wonderful thank you from one this year! As soon as you have a program secured please notify the Program Chairman, Joan Davies @788-2348 or 727-7155 or jdavies2348@msn.com with the Title, Name of Presenter and contact information. Dex Gannon died on Jan. 4, 2010. He was born on Aug. 11, 1989, in Santa Monica, Calif.
R otarians are members of Rotary clubs. Rotary clubs belong to Rotary International. To become a Rotarian, you must be invited to join a Rotary club by a member of that club.